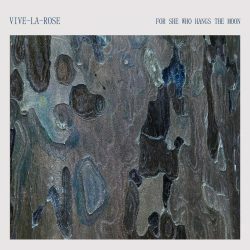 ‘For She Who Hangs the Moon’ is David Luximon-Herbert’s first full album release as Vive La Rose, his solo project that began with the well-received 2014 EP ‘Don’t Move, Don’t Speak’. Once again, this release showcases Luximon-Herbert’s distinctive, husky voice; his hushed vocal creates an emotional intimacy that serves these songs well. This is an album to lose yourself in, full of absorbing, dreamy soundscapes that would make a compelling cinematic soundtrack. The beautiful, slow piano melody of ‘Night Terrors’ tiptoes into the album with a feeling of defenceless vulnerability, asking where the sentinels have gone that would: “…shield us from harm.” However, there is hope: “Don’t know where I begin…It’ll never be right, to let the night terrors win.” There’s an intense and haunting poetry to the song and it acts as a perfect introduction to the reflective music that follows. Next is the uplifting ‘Rio Grande’, offering an immediate contrast and serving to resolve some of the tension created in the opener. It is the album’s musical highpoint and tells the romantic tale of a couple who dream of seeing the world: “Wanderlust is how we feel.” Another tonal change brings ‘Before We Lose the Light’, which begins with an extract from JFK’s 1962 speech about the space race before the piano and strings creep in. References to the stars and sky sit alongside more personal details and the London riots of 2011 as the narrator asks: “Who turned the telescope round to the streets below?” There is a clear contrast between Earthly social and individual troubles and the unity that comes from great human endeavour and the need to find something bigger than ourselves. Contrasts are to be found all through the album, both in theme and through careful track sequencing that ensures variation in tone throughout, meaning that, although the album is reflective, it never wallows in melancholy. The songs flow well, aided by small but effective decisions, such as ending a song and starting the next with the same soft vocal. Luximon-Herbert also demonstrates an instinctive understanding of when and how to introduce and layer additional instrumentation, such as the brass in ‘Given Time’, the electric guitar in ‘Of a Fire on the Moon’ and the organ in ‘Sirocco’. The songs are enhanced by the wonderful string arrangements provided by Colin Elliot and the Up North Orchestra and Terry Edwards’ gorgeous brass. The album closes with the hopeful ‘Sirocco’, which notes that: “Neon’s just as bright when it rains,” and the weary sounding ‘My Shadow’ with its gritty, faltering vocal. By the end, this feels like a completed, cohesive piece of art. It is a proper album, in that all of the songs are better in the context of the other tracks, reinforced by the themes and sounds that run through them. It’s an album to listen to completely to fully appreciate. ‘For She Who Hangs the Moon’ is an absorbing achievement of imagination and artistic reflection.